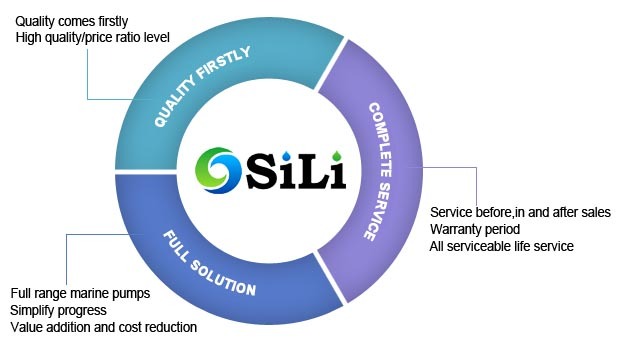 Our vision: A reliable one-stop supplier of full range marine pumps from China. We only supply the top quality marine pump and its spare part from Chinese marine pump brand. Low price usually accompany low quality, so even if the low quality pump seems its price is competitive, we won't accept it. We believe in building, sustaining and strengthening relationships with our valuable customers at a possible highest quality/price ratio level. 2. Full range marine pump solution. We only focus on the marine pumps, but we are very specialized in them. We devote ourselves to be a one-stop solution of full range marine pumps. By this way, we hope to save purchase cost and simplify purchase procedure for our clients. We believe in creating long-term business cooperation through an ongoing process of value addition and cost reduction. 3. Complete service in all pump lifetime. We provide full 12 months warranty time from shipment time. But also we are responsible for the after-sales during all the service life for the marine pumps supplied by us.